Confession time. 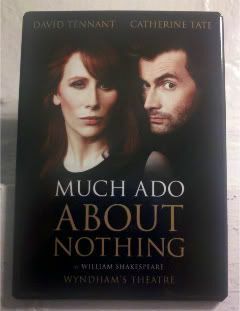 I follow a lot of folks on Twitter surrounding the David Tennant/Catherine Tate production of Much Ado About Nothing. A couple of the actors, a couple of the bloggers, a couple of the fansite folks, etc. But that's not my confession. My confession is that, despite following all those Twitterfeeds, I seriously had an OMG moment in London that #muchado was really for Much Ado. Now, in my defense, I must have known at some point. But for some reason, in my head, #muchado had become a word, pronounced like the Spanish muchacha or muchacho. It was one of those OMG moments of extreme stupidity, that has perhaps replaced all the other moments of extreme stupidity. And, I keep repeating it with a giggle now, Mooochadoh. Which is why I can't really judge the two little teenyboppers who sat next to me at #Muchado. The ones who asked us was the play done, and where we were going at the interval. No, really. They couldn't tell that the play had been left mid-story at the...interval? But anyway, yay for David Tennant still reeling the young ones into Shakespeare. And yay for not being ill for today's performance!!! Thank you SO much, David Tennant! Ya'll have no idea how happy I was not to see the little sheet, or the hear the announcement saying, "Ladies and Gentlemen, the role of Benedick will be played by [insert understudy here]." I would have seriously gone down to the box office, and left a really not-nice note demanding a public apology from the man himself if I'd flown all the way over from the US twice and not seen him perform. And, it was a great performance, too. There's a reason they're getting accolades, and it's not just cuz they're Doctor Who alum. They have fantastic chemistry (right up to the kissing, anyway, but I have trouble seeing David kiss anyone - weird, I know), and David and Catherine really made this Shakespeare dramedy fun to watch. They were surrounded by an excellent cast, which made it so much better. The show was funny in the appropriate parts, a bit teary in others - in fact, a lot more teary than I expected. And, with it being set in 80s Malta, that just added a bit more fun to it. It's always fantastic seeing how different companies stage Shakespeare, the decisions they make with setting and costumes, the line deliveries, the add-ons, etc. I love it. Mind you, no matter who is playing her, no matter what the production, I still regard Hero as the worst, most niminy-piminy heroine ever in the history of heroines, for taking Claudio back after the way he devastated her at the altar. I hate her for it. I mean, really, you can totally tell a man wrote that story! So I bought five. For my sisters and friends. And me. I mean, damn, it's a helluva magnet! I'm so happy that he showed:) Really though, how cool that you got to see them and in what is reported to be a really excellent production! Very cool! VP, I was totes ecstatic that we could see him. That eyepatch Tweet scared the bejeepers out of me. And, they really were amazing to see. Wish you guys had been there! All that, and a bag of grits! Some say ambrosia. Some say...Watergate Salad? "British Culture with an American Accent"
Whither thou Rich Tyra Chronicles? Where the streets have a name. And a magnet, too. I can feel it. The turn of the Earth.